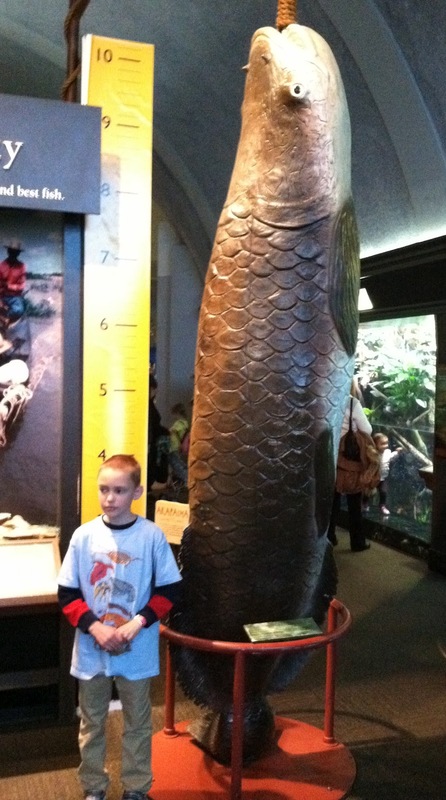 Life Before the Dinosaurs: Chicago After The Field Museum (Part 4 of 4): Shedd Aquarium. Chicago After The Field Museum (Part 4 of 4): Shedd Aquarium. I went to Shedd Aquarium and it was so cool. 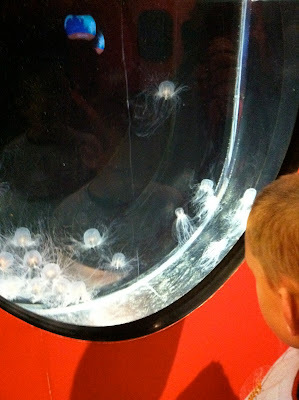 They had an exhibit on jellyfish, which I was excited about. They had really weird jellyfish. They had a really big tank full of moon jellies and it was packed. There were jellyfish in a huge swarm and each had a bell that was about one foot across. I could even see the orange food that they had eaten because they were so transparent. 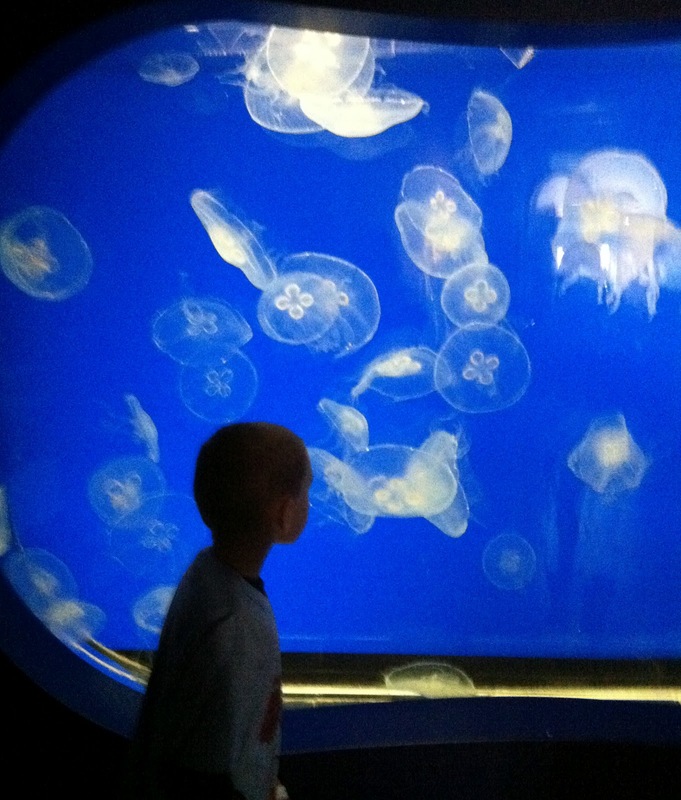 It was all up inside their stomach, which is in the center of the jellyfish. Jellyfish have been around since the Cambrian Period, and I have a couple of fossilized jellyfish from the Carboniferous Mazon Creek. These are sea nettle jellyfish. Their pulses looked very strong, and that probably helps them drawn water into their bell with plankton, and then push out all the plankton onto their tentacles, where it is then stung and killed, and then fed to the mouth. These are upside-down jellyfish, a very bizarre kind of jellyfish that spends almost its whole life stuck upside-down to the bottom of the ocean (hence the name upside-down jellyfish). Although this is for a reason. They have algae living inside their bodies which gives them food. In turn, the jellyfish stick upside-down to the bottom and face the light, which helps the algae grow. They have a symbiotic relationship with the algae. These are called hairy jellyfish, which is obvious when you look at their tentacles, which are very thin and hair-like. They also were very slow, and there was a lot of time between each pulse. They look a lot like some deep sea jellyfish, and they also look like box jellyfish a little bit. This is a video of Pacific sea nettle jellyfish, a larger species of sea nettle than the ones in the photograph I previously mentioned. It's a really cool video. The jellyfish seem even stronger than the other sea nettles, and they are certainly formidable predators of copepods and other plankton. This photograph is of two arapaimas, a type of fish from the Amazon River that grows to ten feet long, and is also a living fossil that has its origins in the Cretaceous. The related arowana is also a living fossil. They had those at Shedd Aquarium, but I didn't get a picture. They were about one or two feet long. This is a picture of me posing next to a freshwater stingray from the Amazon River. It is stuck to the glass, and its mouth and gills are clearly visible. I thought the freshwater stingrays were really amazing. This was a huge life-sized model of an arapaima, which shows just how big they can get. The scales were huge. This is an image of a huge school of cardinal tetras, a fish from the Amazon River which is commonly found at pet stores, probably because of how beautiful the shimmering swarms of them can be. I could see them from a long way away. They were so bright. It's almost like they were glowing. This image shows a moray eel, a beautiful marine eel that grows to ten feet long. We also saw some electric eels, a type of knifefish that can grow to eight feet long, which makes it the largest knifefish species. They are also deadly because they can shock up to 650 volts. They had a giant spider crab, the biggest species of crab in the world. In the wild they are often found in the deep sea where they have an opportunistic lifestyle, picking up and eating any scrap of edible debris they can find. The next day it was time to leave Chicago, and I really didn't want to go. It was so sad to leave. 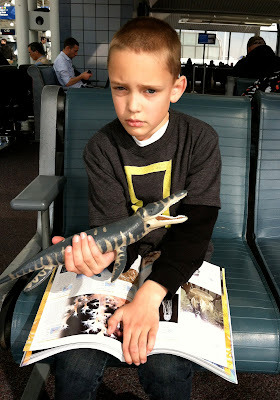 We went to the airport and the Kronosaurus had to go through the X-ray two times for some reason. I couldn't stop reading my new book. Art had a ton of new experiences and a fantastic time in Chicago. A million thanks to: Paul Mayer, Jane Hanna, University of Chicago Secular Student Alliance, Stephen & Kayla & Greta, Casey, Mike, Dave Monroe, PZ Myers, and the 72 incredible people who pitched in to help fund our trip to the Field Museum. Happy Birthday Art!! 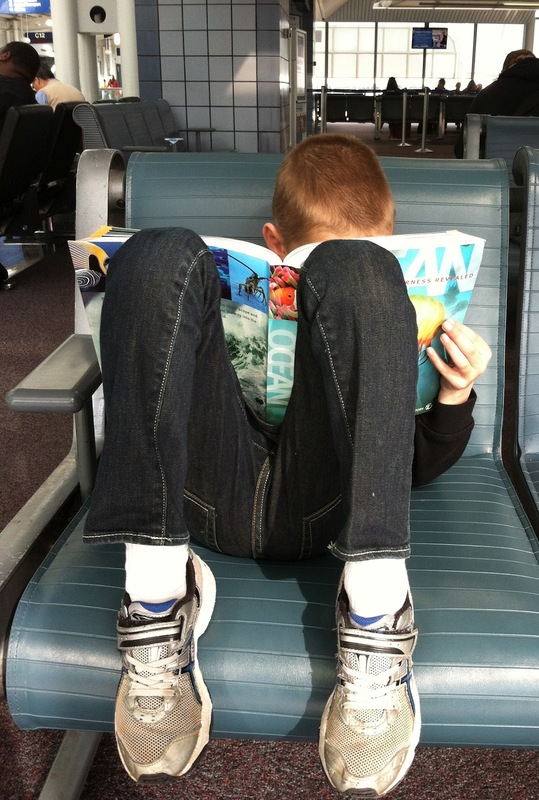 I loved reading your Chicago Blog and I am happy to hear that you enjoyed your visit to the Field Museum and Chicago. Hi Paul! Thank you so much for giving me a tour and showing me all the amazing invertebrate fossils. I thought it was really amazing! Great exploits and a fantastic journey! 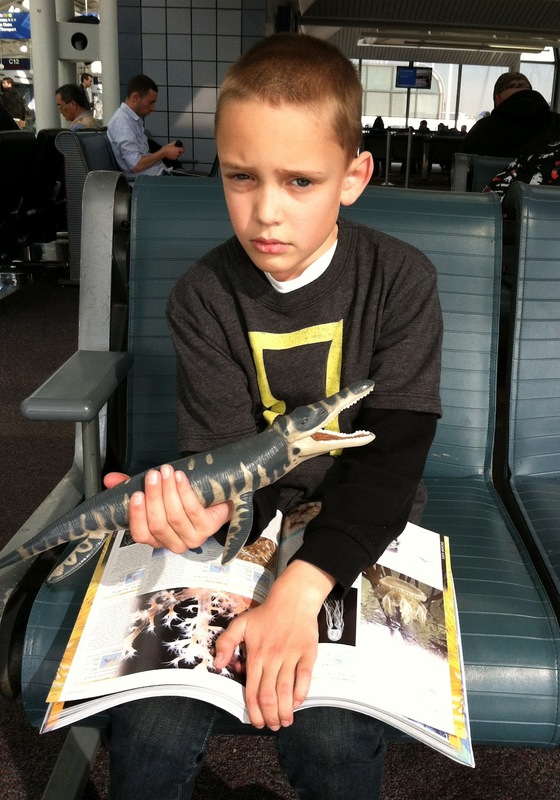 (Plus, the picture of you with the Kronosaurus in this post is priceless!!) I know you will return to these places one day (and go find Mazon Creek, too). And, one day, perhaps you will host one of these magnificent adventures for someone else like you. That looks like it was an amazing time. I loved the video of the jellyfish. I'll have to visit Chicago someday so I can see all these things. The Field has been my favorite museum since I was your age. I have not been in the Shedd Aquarium for far too long (since before the dolphin tank). Huh. I've survived the same way as jellyfish. Today I told my mom that I liked creatures with cold blood or no blood. Which one are you?